Being a criminal in Rio de Janeiro has never been a safe business, but this year it’s more dangerous than ever. On February 16, Brazil’s federal government seized for itself the administration of security in the state of Rio, normally an exclusive domain of the state government. President Michel Temer signed the decree, declaring that this “extreme measure” was necessary, as organised crime had become “a metastasis spreading over the whole country… [that] almost took over the state of Rio”. This act marked the beginning of an unprecedented federal intervention in Rio de Janeiro’s public security. Although the Armed Forces have often operated in Rio against crime, they always did so in cooperation with the state government. Temer, however, decided to entrust them with this intervention. Thus, they now have command over the local security forces: a situation that has never been seen since the end of the military dictatorship and the adoption of the current constitution, thirty years ago. Notwithstanding the new power relation determined by this move, it is not yet clear what results these extreme measures will achieve. Although, on paper, the intervention has the leeway to bring an even fiercer fight against organised crime, it is bound to meet formidable resistance from Rio’s well-established criminal groups. The most visible – and most targeted – among these groups are the drug trafficking alliances, called “factions”, whose main business is dealing in marijuana and cocaine from heavily defended drug-selling points inside of the city’s slums (favelas). Rio’s factions have learned many hard-fought lessons from the city’s past history of Armed Forces involvement in security affairs. From the outset, the federal intervention was not meant to impose purely hardline security policies. The federal government announced also that it would bring about a sweeping reform of the local police forces, with a particular attention devoted to uprooting corruption. However, what has been done up to now has yet to live up to these statements. The operational mode of the security forces, mostly consisting in raids by tactical elite battalions or short-lived occupations, has not changed at all in the past months. The only exception to this are the Pacifying Police Units (UPPs), Rio’s experiment with “counter-insurgency” (see Muggah & Mulli 2012), which have been downsized by the interventor, due to lack of manpower and loss of local control. So far, the promises of vast security sector reforms have only produced a “strategic plan” that took four months to be written and put forward no long-term ideas. At the same time, the federal government marketed its intervention as an opportunity to carry out a harsher crackdown on organised crime by imposing fewer restraints on the use of force. For example, ministers called for sweeping investigation and search powers, possibly covering entire neighbourhoods. Although these ideas were soon discarded, the very nature of having soldiers operating against crime inherently means less oversight from judicial authorities. Allegations against members of the Armed Forces, in fact, can only be examined by military judges, a fact that may lead to eventual impunity according to Amnesty International. At the same time, authorities seemed to recognise this, admitting that “undesirable things, even injustices” could occur during the intervention. For this reason, too, Army Commander Eduardo Villas Bôas asked that a “Truth Committee”, similar to the one established in 2011 to investigate crimes committed during the military dictatorship, should not take place in the future; a request contested by human rights groups and prosecutors. To a trafficker, all of this may look like really bad news. In reality, there is likely to be little despair among criminals in Rio. Over the past 25 years, faction members have learnt a few lessons that will make them weather the storm. And where these lessons might not allow individual criminals to live another day – one of the main effects of intervention has so far been a 46% yearly increase of deaths following police intervention – their businesses will most likely live on. The first lesson is, simply, to hide. This is not so different from what insurgents and rebel fighters do in asymmetric conflicts, a similarity that has not passed unobserved among some practitioners in the Brazilian Army (for example, Alessandro Visacro, former commander of the 1st Special Forces Battalion, noticed it in his book Irregular War). Traffickers have the advantage of not wearing uniforms or distinctive signs. Factions admittedly have names, symbols, and mottos that strengthen their identity but most traffickers learnt long ago that, in general, it is better not to display your gang membership in public. In a set of instructions reportedly drafted in the early 1980s, avoiding tattoos was already one of the twelve most important rules of the “good bandit” (see Amorim, A irmandade do crime, 2015, 167). This means that, in general, traffickers are indistinguishable from other teenagers/young adults living in a favela. They can thus easily ditch their weapons and blend in among local residents if they are being pursued. This fact, coupled with the advantage of hidden defensive positions and extremely complex terrain, makes it extremely difficult for security forces to recognise suspects. Only intelligence and investigative work allow to overcome these obstacles: exactly the kind of advantages that Army soldiers, who come from all over Brazil, cannot reap. The second lesson is that outside forces are often not powerful enough to occupy all the irregular and dense space of a favela. Trafficking factions in Rio have therefore repeatedly demonstrated that it is possible to weather the initial effects of military occupation, carve marginal spaces for business, and eventually fight to regain lost territory. This is what has happened in the past seven years in favelas (or groups of them, complexos) such as Rocinha or Alemão. Although both these areas were occupied with Armed Forces assistance and then “pacified” through deployment of UPPs, over time traffickers managed to create areas in which the police was increasingly reluctant to operate, and in which they could again display and deploy weapons. As a consequence, police estimates from August 2017 showed that UPPs still had full control over only 5 of 39 favelas. Of the four UPPs present in Alemão, two had lost more than 55% of their territory, with a third having lost 35,4%; in Rocinha, another estimate from September 2017 showed that 51,6% of the territory was outside the reach of regular police forces. This can equally be the case when Armed Forces are involved. The recent occupation of Complexo da Maré, an ensemble of 16 favelas, shows just that. The Armed Forces occupied Maré for 15 months, between April 5, 2014 and June 30, 2015. The operation involved 23.5 thousand soldiers, around 85% of those deployed in the UNSTAMIH mission in Haiti, and costed R$559,6 million (around £113,5 million pounds). These resources secured 674 arrests and 1.356 reported seizures of drugs, weapons, and vehicles. Whilst in that period the occupation decreased murder rates by 75% and trafficker profits by 79%, faction presence still did not come to an end. Traffickers at first hid inside the Complexo, exploiting their local knowledge and networks and observing the soldiers’ behaviour. Then, they started teasing them with regular shootings and the occasional grenade. On average, soldiers experienced two attacks daily and the Army even suffered its first casualty on home territory since 1972. Midway into the occupation, traffickers were able to establish areas of armed control where they could display weapons, check on who was coming in and out, and even carry out attacks on each other. It is perhaps no wonder that some soldiers cheered on their buses when they handed Maré back to the local police force. The latter then quickly returned to the old modes of operation. Just a week after the end of the occupation, the Military Police deployed tactical elite battalions like BOPE (Special Police Operations Battalion), with a 20-year-old man hit by a stray bullet during the operation. Even on those rare occasions when hiding and carving up spaces has proved impossible, there is still one last viable option: escape. This was notably the effect of the occupation and installation of UPPs in some favelas, like the Complexo do Alemão. Following an intolerable string of attacks against police stations, buses, and ordinary citizens, Rio’s security forces decided to occupy the area, as intelligence alleged that the orders to carry on the attacks came from the leaders of the Red Command faction hiding there. On November 28 2010, 2.600 police officers and soldiers proceeded to occupy the Complexo, which, by that day, was hosting traffickers from there as well as from outside; these had already escaped through a forest from police operations nearby. 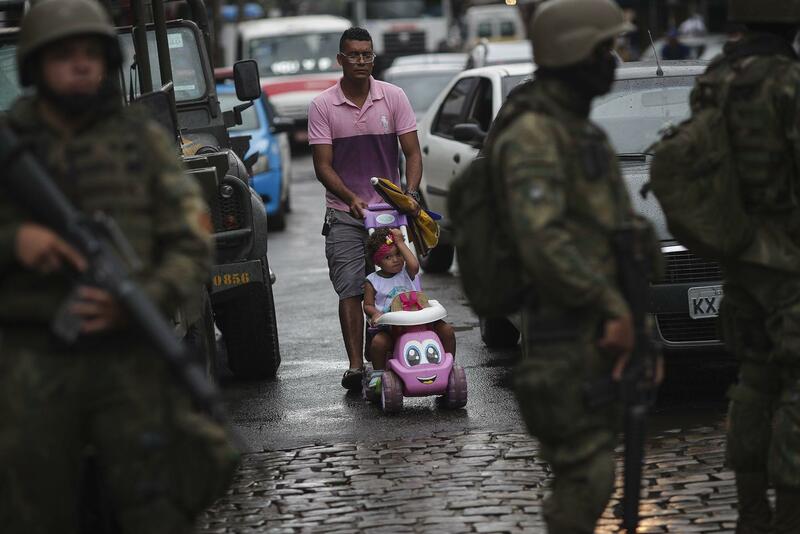 While there were several shootings in the preceding days, with 37 people killed between November 21-28, most Red Command members present in Alemão managed to escape again, this time through a minor exit road. Security forces did little to prevent this, as the “pacification” of Alemão was already a major task and required by itself all available resources. The traffickers who escaped, however, emigrated to another vast favela in the area, Jacarezinho; and then, when that favela was occupied, too, they migrated to Covanca, a favela in the Western zone of the city, where they overpowered the local paramilitary group and established their business. Other traffickers left for cities in the metropolitan region, like Niterói, Macaé, and Japeri, that were untouched by the pacification process. This migration reproduced on a metropolitan scale what happened in Latin America at large as a result of U.S.-directed drug eradication policies, whose efforts to destroy coca plantations in one state normally resulted in the displacement of production to neighbouring countries. This is the so-called “balloon effect”: a long time enemy of law enforcement agencies that has effectively arrived in Rio, too. Drug factions have learnt these three lessons (hide, fight, escape) the hard way. Over the past ten years, many of their members have opted for one or more of these courses of action; those who did not have been either arrested or killed. It is likely that those who remain under this new occupation will continue to act according to them, unless the Armed Forces and the police evolve tactically and strategically. However, the predominance of incursions and short occupations, even in “pacified” areas, points to the unlikelihood of an operational change. Given this context, traffickers know enough to make themselves, or at least their business, survive well beyond the end of this intervention. Andrea is a PhD candidate at the Department of War Studies, King’s College London, as well as the Editor-in-Chief of Strife Journal and Blog. His research focuses on urban armed groups in Rio de Janeiro and São Paulo. In particular, he seeks to explain their resilience through an evolutionary/ecological lens, by analysing the history of their internal changes. Andrea holds an MA in International and Diplomatic Sciences from the University of Bologna. You can follow him on Twitter @Andrea_Varsori.